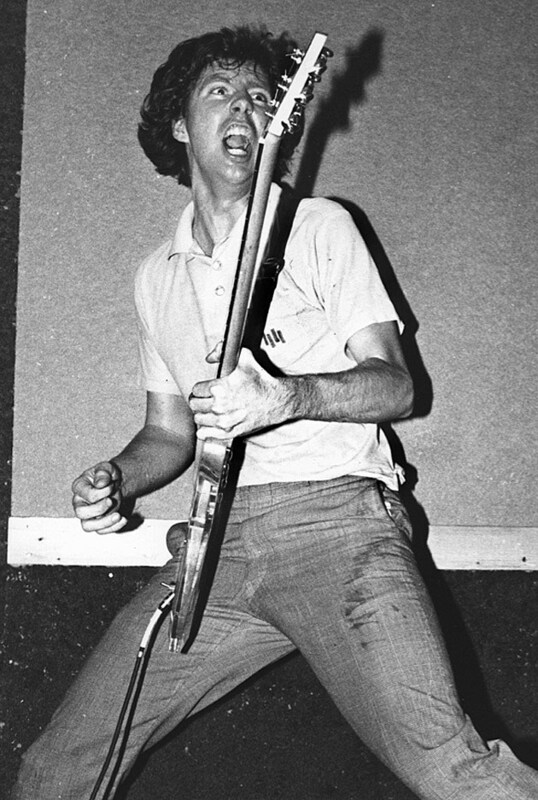 Greg Ginn is someone I’ve wanted to speak with since I started Heavy Metal Be-Bop in 2011. Obviously, Black Flag, particularly the concluding half of My War, has had a huge influence on the modern metal underground, but what fascinates me most about Ginn’s work, both in Black Flag and in later projects such as Gone, the Killer Tweeker Bees and Jambang, is its strong improvisational drive. I hear Black Flag’s instrumental material (1985’s The Process of Weeding Out, side 2 of 1984’s Family Man) not just as a strange offshoot of punk, but as an important step in the evolution of so-called fusion. Along with bassist Kira Roessler and drummer Bill Stevenson, Ginn tapped into a current of hybrid jazz-rock musicmaking that began in the late ’60s and early ’70s with bands like the Tony Williams Lifetime and the Mahavishnu Orchestra, and continued to evolve in 1971–74 King Crimson. Like these earlier groups, the Ginn/Roessler/Stevenson trio—led by a guitarist on a relentless quest for the most vile-sounding notes he could summon—fused raw, rock-derived intensity with the improvisational drive of jazz. (“I remember trying to wrap my head around some of [Ginn’s] solo ideas,” Eagle Twin’s Gentry Densley told me in HMB #5, “how he could make them sound so out.”) Though Ginn’s later work is far less well known, and generally less heavy, he’s continued to explore various improv-driven amalgams for the better part of the last 30 years. Greg and I met in Manhattan in July of 2012 to talk about jazz and metal. I’ve been talking to a lot of jazz and metal musicians for this series, and your name seems to keep popping up as an influence or reference point. I’ve read interviews where you’ve touched on jazz in passing, but I wanted to dig deeper and figure out how it influenced your own work from Black Flag up until now. Could you talk to me about your introduction to jazz and improvisation? I was fortunate growing up in Hermosa Beach to live near a great jazz club called The Lighthouse, which has been remodeled and it’s not a jazz club anymore. But starting in the late ’40s or ’50s, it was a very important jazz club up through the ’70s. I was into all kinds of music. I really didn’t get into music until I was about 18 or 19, and one of the first types of music I started seeing live was jazz, and it was right there. I didn’t have any idea of the significance of the artists I was seeing and their historical place at the time. I just really liked the music and I just walked down there. They didn’t have an age limit; I saw a lot of great jazz there. That was really my live exposure, was really early in me being interested in music at all, so it’s always been part of my musical spectrum. It’s not something where I started out in rock wanting to be in a band. It was something that became just part of the music I liked. I saw a lot of great jazz and blues people that played at The Lighthouse: Yusef Lateef, Sonny Terry, Brownie McGhee, The Persuasions, Sonny Rollins, Milt Jackson. So that was my early introduction. I never studied jazz or studied music, for that matter; I’m not a well-educated musician in terms of academically, so I never had the ambition to play in a jazz band. I just always have written my own songs and used whatever influence is around. I’ve never played covers a lot or that kind of stuff. That was my initial introduction. Obviously, the earlier Black Flag songs were very structured, but there was a point at which the band moved into more improvisational territory. Could you take me back to the moment when you decided you wanted to start incorporating some of these ideas in your own music? Well, I always assumed that we did [incorporate improvisation], because that’s how I practiced and played. I would play bass or rhythm guitar and play various progressions and then play over them. To me, improvising has always been central to my music and it’s always fed off that. Black Flag was the first band I was ever in. Part of as a learning process—I never was in a band—I’d just play by myself and record. I’d play a bass part or different chord progressions and play over them and just experiment, just by improvising, rather than learning songs. I got into it more as a creative thing and a songwriting thing, rather than, “Oh, I want to learn these songs and play like…” I was more interested in playing my own music. It was more band-member changes and evolution led it to where it could be more improvised. Early on, the other band members pretty much discouraged that kind of stuff. “Keep it simple; why do you want to get ahead?” There was almost a discouragement of practicing. And I was always into practicing guitar. But the early punk scene, there was a certain strain of “You shouldn’t practice; you should just bang it out, and we’ll be fine.” And that’s something I always went against the grain about. And sometimes that meant going against bandmates or whatever. And as it went on, I became increasingly intolerant of people that weren’t open-minded to playing music. As opposed to being restrictive and conservative, [I was looking for people] that were open to experimenting and going in different directions. You mentioned laying down chord progressions and improvising over them. You can follow that idea through from The Process of Weeding Out up through your current work with the Royal We stuff. In the Royal We, there’s often a steady loop in the background and you’re either playing with it or against it. It seems like something you’ve been into for a long time: a groove on one hand, and freedom in the other. I tend to like, whatever kind of music it is, music that grooves more, whether it’s in a jazz vein or electronic music or rock. I’m not real big on progressive rock; it doesn’t have a groove. Some of it I like, but for the most part I don’t listen to a lot of technical jazz or fusion. I like early fusion, the Mahavishnu Orchestra. I think that’s another element of jazz that did have influence on me later, whereas the early time was more traditional jazz—The Lighthouse, before fusion happened. Then, when the Mahavishnu Orchestra came out, I really liked that a lot. I saw them a lot of times. I was into them when they first came out, and I think that had a big impact on my music. What was it about them that stood out? Well, there wasn’t anything like it. I don’t know if you’d call it jazz or rock; it had a lot of classical influences too. It was kind of a fusion of more than rock and jazz. Just real powerful and I just loved the songs—the intensity of the songs. Sometimes I’ll just go back to it and have a Mahavishnu Orchestra phase. But I think that had a lot of impact, starting in ’72, ’73, something like that. They kind of had a groove. I love Rick Laird’s bass playing; I think it’s just amazing. And I think that was very key when you have a drummer like Billy Cobham who was really going off. He had good time, but he’s not really a groove drummer by any stretch, so having that kind of bass player that’s really not like later fusion bass players—I don’t like much in terms of later fusion. I like some Chick Corea and that kind of stuff, but I started in losing interest in all that. But I’ve always liked the Mahavishnu Orchestra. But when it started to smooth out… When you bring up metal and jazz, I see a lot more crossover between fusion and metal, and I’m probably not real big on that. As far as metal, I’d rather hear Ritchie Blackmore—with more groove. In that sense, my jazz influence is more the older jazz or the first wave of fusion. Do you remember talking to Bill Stevenson and Kira Roessler about Mahavishnu and things like that during the Process of Weeding Out period? What were your objectives on those recordings? [Kira and Bill] didn’t really have a background or seem really interested in jazz, as far as the older jazz. But Bill got really into the Mahavishnu Orchestra and King Crimson. I’m sure he picked those up from me and absorbed those. So that was the really the common point. To me, The Process of Weeding Out also has other elements that aren’t fusion, that are freer, in an older-jazz kind of way. But that’s where [Kira and Bill] intersected with me, was with Mahavishnu and King Crimson, when it comes to improv but heavy. There’s not a lot of people who did that well early on, so there wasn’t a lot of other people to point to really. We haven’t really touched on free jazz, so to speak. You mentioned Coltrane, and obviously in later Coltrane or something like Cecil Taylor, the rhythm kind of exploded. Were you checking out things like that as well? Oh yeah, that’s the element that I’m speaking of that wasn’t in the Mahavishnu Orchestra but was in The Process of Weeding Out. To me, it’s like we kind of faked groove a little bit, but to me, the Process of Weeding Out pieces are more free-form things that we just practiced a lot, rather than having that good of a groove, which I’d maybe prefer something to come in and out. So I took them as more free in a lot of ways, and we’d make sure that they would open up and get free rhythmically. That’s definitely a part of those songs, and that’s always been a part of my music. My favorite band was always and still is the Grateful Dead, and they always had that element to their set and I really liked that. There’s an element to their sets where it goes off the anchor and just gets into sound more than a groove or a riff. That was part of what we were trying to do with those songs, to start out with some common territory but make sure we’re not holding on to a rhythm at all times, but then go off into the abstract. In pieces like “Black Coffee,” were you consciously trying to push your guitar playing into a more “wrong” or off-sounding place? Maybe so, but while I can say “wrong,” it felt right; it’s not a mistake. I could play a whole set and say, maybe I’d play one or two notes I didn’t want to play and those are wrong notes. The rest of the set, people either like it or not, but it’s not wrong. Right, some people take that to mean an accident or something like that. But I don’t play very accidental. If it’s an accident, then it’s an accident, and I don’t like it. Now on the other hand, I think my playing goes back to improvising and trying all different kinds of things over different chords and trying to find stuff that’s exciting and interests me as well. Like, “Wow, I could put this note here, and it’s not the note I would’ve thought of, but it sounds cool.” So it’s really trial-and-error. But the accidents hopefully come more in practice, and if they’re good accidents, then I end up going back and using them. Right, and then those experiments can get written into the music. I think of a piece like “Obliteration,” where the notes have such a sour quality. That’s an instrumental, but the sentiment of the piece mirrors the lyrics of the other songs on Slip It In. Do you remember writing that piece? Yeah. I guess, to me, it was again about finding a common ground with Bill and Kira: King Crimson, Mahavishnu Orchestra. I’m sure to them that’s how they would relate to that song, which I would too. That’s what I thought: “We could do this, and it would be an introduction to a little bit of a different kind of rhythm and music to them.” Another thing I remember about that song is just the tension, and relating that tension not so much to stuff in rock but to Mahavishnu or King Crimson. Those two kinds of jazz-rock bands used a lot of that same kind of tension. Yeah, I think of those pauses in that song and also in “Slip It In,” how the songs kind of grind down to a halt and you don’t know when it’s going to start up again. It’s a cool rhythmic device to create tension. Yeah, and if you play it a lot, then it’s not necessarily counted out. You’ve learned the feel, and you’re just coming in when it feels right, and the best feel is not necessarily the right count. The best feel might be to come in slower—not on accident, but it just feels good to do it that way, so you end up practicing it every time. Have you heard the guitar player Masayuki Takayanagi? He was kind of the predecessor to someone like Keiji Haino, or Japanese noise. Incredibly loud, but also really smart. Whereas someone like Derek Bailey was much more contained. Yeah, lot of times, “improvised” is equated with “quiet,” and it doesn’t have to be. That was what was different about The Process of Weeding Out. I think one reason for that is, I think it’s a lot harder to improvise and pull off something with a bombastic, full-on approach. It’s easier to come off as sophisticated or “jazz” by keeping it mellower. So I think that people that consider themselves “players”—they want to show off their skills—it’s easier for them to keep it down a little bit. Because just physically, if the drummer is playing hard, you can’t react so quickly and finesse everything. You’re committing and staying with the guitar; you can’t turn on a dime. You’ve got this a big rig that you’re improvising with and it’s not as impressive on a musicianship level. A lot of musicians they just think of “bombast” and they think, “Oh, I can do that,” and they’ll go into a rock beat or something; they don’t see using that as a [valid form of improvising]. So that’s why it’s kind of rare; it doesn’t reward the musician very much. We discussed how you were accused of practicing too much. It’s interesting, because in your case, it seems like practicing made your playing weirder—specifically your soloing on the later Black Flag records like Loose Nut and In My Head. You were able to tap more into a personal style. So if we’re hearing, say, a seven-minute instrumental Black Flag song, is it safe to say that you would have been practicing that piece for hours on end? Oh, yeah. Especially stuff like The Process of Weeding Out. The band could not have done that without… ‘Cause a lot of the timing stuff is real free and we hit certain [accents], so they have to be memorized. That’s why an album like that—yeah, it just couldn’t happen without a lot of playing, and playing those same songs a lot of time. We played the songs live for a long time before they were recorded. So they kind of got arrangements, sort of the same arrangement every night, even though it just started out as “Let’s go on this trip and see where it goes.” But then you find certain things or certain points where you go into a different kind of a thing—communication between the [members]. With that particular band, if not just any band, that record took a lot of playing together. Many, many hours on each of those songs before they were recorded.